Jennifer Wauleah Lunsford of Miami, OK passed from this life Thursday, April 4, 2019 at Freeman Hospital in Joplin, MO. She was 48. Jennifer was born October 28, 1970 in Miami, OK the daughter of Richard and Barbara (Kyser) Collier. She had lived in Miami all her life and graduated from Miami High School Class of 1988. She received her Associates Degree from NEO A&M in Miami, OK, her Bachelor’s Degree in Deaf Education from Tulsa University and her Master’s Degree in Special Needs Education from Pittsburg State University. She had been a Special Needs Teacher and Cultural Coordinator for the Quapaw Nation. 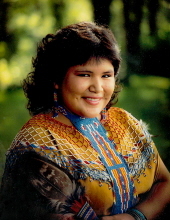 She was a member of the White Mountain Apache Tribe and San Carlos Apache Tribe. Jennifer followed Native American Church ways and was very active in Pow Wow’s for many tribes and Native American activities and she loved to cook. She was a member of the Kiwanis Club of Joplin, MO. Jennifer was preceded in death by a brother Lance Allrunner and her grandparents Bill and Reberta Kyser. Jennifer is survived by her parents Richard and Barbara Collier of Miami, OK, 3 brothers Brian Collier of Norman, OK, Kevin Collier of Champaign, IL and Darren Keah - tigh, 5 sisters, Michelle Bible Shield and husband JoJo of Wyandotte, OK, Susie Anderson and husband Kenny of Neosho, MO, Charla Kay Echohawk of Norman, OK, Mariah Tyner of Quapaw, OK and Lori Tyner Beaty and husband Clinton of Jay, OK, a great uncle Ben Kyser and wife Alyce and 2 great aunts Kay Kyser and Dee Barrett and several nieces and nephews. To send flowers or a remembrance gift to the family of Jennifer Wauleah Lunsford, please visit our Tribute Store. "Email Address" would like to share the life celebration of Jennifer Wauleah Lunsford. Click on the "link" to go to share a favorite memory or leave a condolence message for the family.